Stainless Steel products – European Quality vs. cheap Far East imports. We all take for granted that Stainless Steel offers high resistance to corrosion and durability, but it may be worth noting that not all stainless steels are the same. 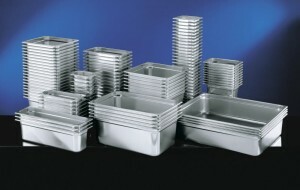 Catering Equipment Ltd. and clickonstore.net only use high quality AISI 304 Stainless Steel on their food quality equipment . The surfaces of Stainless clickonstore.net products that come in to contact with food or drink are always 304 Stainless Steel. Our fellow European manufactures adopt the same policy as ourselves and stick to the well tried and proven safe 304 Stainless Steel. The question we ask the public today is why do large companies buy cheap far east products manufactured from inferior quality 204 stainless steel that is manufactured with high levels of manganese instead of nickel? This combination of metals including the manganese is a potential health risk and should not be used for cooking as there could be a long term health risk. We urge all buyers of stainless steel products to specify AISI304 when purchasing stainless steel items for food use after all the European directive EN631 insist on 304 stainless steel, because they know it is safe! This entry was posted in News and tagged AISI 304, en 631, health and safety, stainless, steel. Bookmark the permalink.